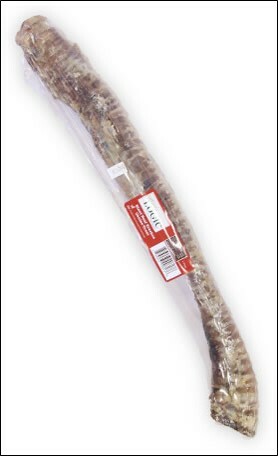 Nature's Logic Giant Beef Trachea is a great dried chew for any size dog - small to extra large! Dried trachea is an excellent alternative to rawhide for a healthy, fully-digestible treat. It's a 100% beef chew made from all natural, Midwest beef cattle graded USDA Prime. This treat provides your dog with a carnivore-appropriate recreational chew that also promotes good dental hygiene. Each individually wrapped trachea is sourced and made in the USA. NOTE: Always supervise your pet during chewing.